I’m delighted to announce the release of a new lineup of WordPress one-on-one training classes that include a premium theme. There’s something for beginners and advanced users alike who are serious about having a solid WordPress and online marketing foundation to become confident, successful site owners. The Prelude premium child theme runs on the Genesis framework. With 12 built-in color schemes and 5 page layouts, plus all of the super built-in Genesis widgets, this powerful and flexible theme can be configured to suit any site layout need. 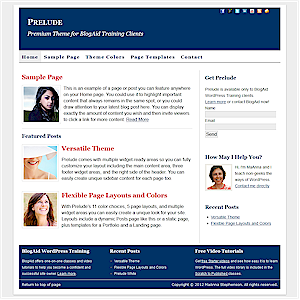 Best of all, Prelude is easy to use and it can grow with you as your site needs change. And, full customization is included! See Prelude all dressed up on the Learn theme. There are now five WordPress training options on BlogAid that are sure to meet your unique site needs and budget. The WordPress Video Tutorials can be purchased as a standalone course or as part of a one-on-one class package. Six new videos on Genesis have been added to the library too! There are two new One Day Class options. The first is for folks who need a little help on their current site. And the other includes a WordPress foundation course plus the Prelude premium theme and how to configure it to best display your site content. The Scratch to Published class package has been extended to four sessions, and you can get Prelude with it too. The course comes with a private training site for six weeks and access to the full video tutorial library. Plus, all training clients now start on the premium Genesis framework. Thank you to my favorite site designer, and StudioPress expert, Cyndi Papia of Office To-Go whose help in creating Prelude has been invaluable. Not to mention her super creation of the Learn design. Because so much attention is given to each client, the open BlogAid class slots are limited and fill fast every month. Contact me asap to make the best investment in yourself as a professional site owner – the confidence to know exactly what you’re doing and why.